A poor second-half performance from Leamington saw their south Warwickshire neighbours Stratford Town take a deserved share of the spoils from this Boxing Day derby clash, writes Paul Edwards. Brakes had gained a measure of control thanks to Richard Gregory’s 26th-minute opener against his former club and things looked increasingly difficult for Stratford when Simeon Tulloch’s red card saw them reduced to ten men before half-time. However, instead it was Carl Adams’ men who upped the ante in the second half, levelling seven minutes from time courtesy of a stunning strike from Kieren Westwood. Courtney Baker-Richardson was inches from sliding in an early opener as Connor Gudger’s low left-wing cross whistled past the far post, while Gregory headed Rob Thompson-Brown’s free-kick straight at Niall Cooper. Mike Taylor fired wide for Stratford after evading a couple of challenges, but Brakes found themselves ahead when Gregory got to the ball inside the penalty area with his back to goal, shielding it well from Westwood before flicking a shot past a static Cooper into the far corner, possibly with the aid of a slight deflection off his former team-mate. Dan Summerfield extended Tony Breeden for the first time with a vicious first-time strike from distance that the Brakes skipper flung himself to his right to divert the ball over the bar. Tempers fray after the incident which saw Stratford's Simeon Tulloch receive his marching orders. The first half then descended into chaos moments before the break when Tulloch received a straight red for a late challenge on Jack Edwards which provoked some pushing and shoving from several members of both sides, Breeden also receiving a booking for his involvement. The visitors used their perceived injustice to fuel their second-half fightback and, at times, it seemed only Breeden stood between Stratford and an inevitable goal. The Brakes skipper was injured as he denied Westwood early in the half and, after lengthy treatment he soldiered on but it was clear that he was struggling, which made his subsequent involvement all the more impressive. Edwin Ahenkorah looked to have a clear run at goal after Dan Preston uncharacteristically gave the ball away outside his own penalty area, but the Town man opted to try and find a team-mate and the chance was gone as Leamington regained possession. Breeden then pulled off a superb save to deny Taylor a headed equaliser, and he pushed another effort from Ahenkorah behind after the midfielder was allowed to get his shot in from the left despite being pushed wide. Taylor was then left shaking his head as Breeden produced an outstanding stop to deny him from an equally good header that looked certain to find the back of the net. The Leamington skipper was powerless to prevent Stratford’s next effort, however, as Westwood, who spent little more than a month at the club at the beginning of last season before making the move to the DCS Stadium for more regular football, unleashed a truly stunning drive from a good way out that rocketed into the top corner to send the sizeable visiting contingent wild. 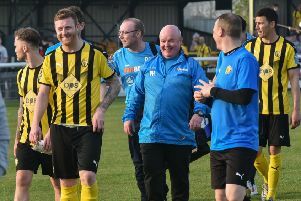 Leamington were simply unable to shake themselves into life and looked a pale shadow of the team that had looked assured during the first half. Gregory took on a pass to shoot towards goal but it lacked the power to trouble Cooper. Ahenkorah almost got clear of Richard Taundry for a stab at a late winner for Stratford, but the Leamington right-back recovered well to make the shot difficult. brakes: Tony Breeden, Richard Taundry, Connor Gudger, Joe Magunda, Dan Preston, James Mace, Courtney Baker-Richardson (Nathan Olukanmi, 86), Jack Edwards, Richard Gregory, Rob Thompson-Brown (Ryan Rowe, 84), Ahmed Obeng. Subs not used: Ben George, Tom James, Ryan Quinn. Stratford: Niall Cooper, Dan Summerfield, Kieren Westwood, James Fry, Liam Francis, Guy Clarke, Simeon Tulloch, Will Grocutt (Justin Marsden, 71), Michael Taylor (Charlie Faulkner, 82), Ben Stephens, Edwin Ahenkorah. Subs not used: Jean Kalenda, Barry Fitzharris, Dylan Parker.